Bishopwearmouth is an area in Sunderland, North East England. Bishopwearmouth was one of the original three settlements on the banks of the river Wear that merged to form modern Sunderland. The settlement was formed in 930 when Athelstan of England granted the lands to the Bishop of Durham. The settlement on the opposite side of the river, Monkwearmouth, had been founded 250 years earlier. 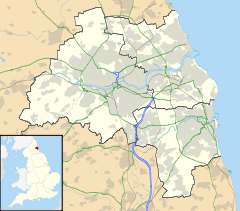 The lands on the south-side of the river became known as Bishopwearmouth, a parish that covered around twenty square miles, encompassing settlements such as Ryhope and Silksworth — now part of the modern Sunderland urban area. Within the parish was another settlement, Sunderland, which was a small fishing port at the mouth of the river. Over the centuries, the port grew in both importance and size, and in 1719 was made into a parish independent from Bishopwearmouth. Bishopwearmouth Christ Church was declared redundant on 11 February 1998, and later sold to become a Sikh temple and community centre. The church of Bishopwearmouth, St. Michael's, became Sunderland Minster in 1998. Major-General Sir Henry Havelock, a military leader during the Indian Mutiny, was born in Bishopwearmouth on 5 April 1795, as was Joseph Swan, famous for the invention of the incandescent light bulb, on 31 October 1828. Rev William Scott Moncreiff FRSE was vicar of Christ's Church in the 19th century. The physician and antiquarian Thomas Coke Squance FRSE was from Bishopwearmouth. ^ "Sunderland's Music, Arts and Culture Quarter - Bishopwearmouth and the Minster". www.macq.org.uk. Retrieved 2018-02-16. ^ "Church Commissioners | The Church of England". www.cofe.anglican.org. Retrieved 2018-02-16.